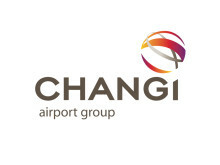 SINGAPORE, 19 August 2013 – Changi Airport Group (CAG) released today its concept plans for an iconic mixed-use complex to enhance Changi Airport’s offerings and strengthen its position as an international air hub. Codenamed ‘Project Jewel’, the new mixed-use complex is envisaged to be a world-class, signature lifestyle destination that will enable Changi Airport to capture tourism mindshare, and strongly boost Singapore’s appeal as a stopover point for global travellers. The complex will offer aviation and travel-related facilities, a wide range of retail offerings, as well as unique leisure attractions. To be constructed on the car park site fronting Terminal 1 (T1), Project Jewel will optimise use of the 3.5-hectare plot of land. There will, for example, be a new multi-storey basement car park. As part of the redevelopment, T1 will also be expanded to allow more space for the arrival hall, baggage claim areas and taxi bays. These enhancements will increase T1’s passenger handling capacity to 24 million passenger movements per annum. Project Jewel is being designed to be architecturally iconic, with a stunning glass and steel façade that presents an impressive view of the complex – from both Airport Boulevard and the sky. Designed by a consortium of design consultants led by world renowned architect Moshe Safdie, comprising Benoy and local architects RSP, a key feature of the complex is a large-scale, lush indoor garden with a breathtaking waterfall. To be seamlessly connected to Terminals 1, 2 and 3, Project Jewel will serve as a node linking the terminals, improving inter-terminal connectivity. There are also plans for the complex to provide a central communal facility for the 32,000-strong airport community. Against an increasingly competitive landscape, where airports around the world are actively growing their destination appeal, Project Jewel will boost Changi Airport’s position as an air hub of choice for travellers. Passengers transiting through Changi are a significant component – about 30% – of Singapore’s air hub traffic. “To strengthen Changi Airport’s competitive advantage and ensure that we continue to capture passenger mindshare and traffic, we must take deliberate steps to enhance Changi’s attractiveness as a stopover point. 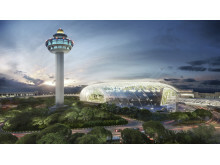 With Project Jewel, we are pleased to be developing an exciting product that will swing travellers to choose Changi Airport, and Singapore,” said Mr Lee. 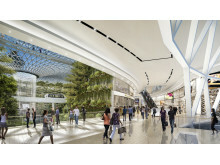 Following a competitive process which involved experienced local and foreign developers, CAG is working with CapitaMalls Asia on the concept and plans of Project Jewel. CapitaMalls Asia is one of the largest listed shopping mall developers, owners and managers in Asia. The two parties are also exploring a joint venture partnership to develop and manage Project Jewel when it is completed. This process is expected to be concluded by the end of the year. 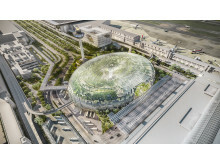 Project Jewel is one of the major infrastructure projects being undertaken at Changi Airport to build its capacity for growth and augment its position as a leading global air hub. Another key infrastructure project is Terminal 4, a larger and enhanced terminal which will be built on the old Budget Terminal site. With a planned capacity of 16 million passenger movements a year, the new terminal is in the final stages of planning, with construction to begin by the end of the year. 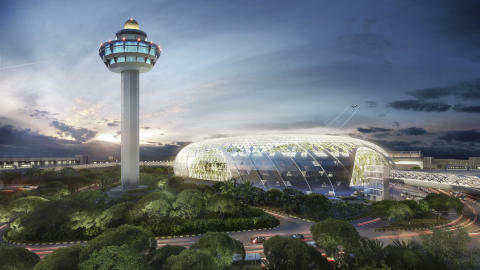 When completed, Project Jewel, together with Terminal 4, will boost Changi Airport's handling capacity to 85 million passenger movements a year, to cater for Changi's growth into the next decade. To staff the teams working on these two developments as well as other upcoming infrastructure projects, CAG plans to increase its staff strength by about 180 over the next four years, with around 80 new employees to be recruited during the course of this year alone. Further updates will be provided in due course. Please credit photos to Jewel Changi Airport Devt. 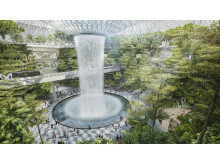 A key feature of Jewel Changi Airport will be a large scale, lush indoor garden with a breathtaking central waterfall. Please credit photos toJewel Changi Airport Devt.